Bristol is set to apply for a share of national funding to further improve cycling networks in the city. A £114m fund has been created for eight cities in the UK, including Bristol, to speed up local cycling network projects. 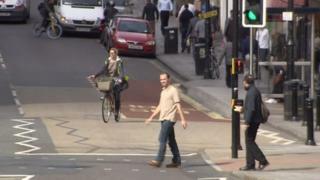 The Highways Agency has also been given £100m to make main routes across Britain safer for cyclists and walkers. Bristol City Council has said it will try to secure "as much as it can" as it is a competitive bidding process. Assistant mayor Mark Bradshaw said: "We haven't seen the fine print but it is very much about pedestrian access as well as cycling access. "It's about addressing the need for a segregated network... and how we work with schools to encourage young people to cycle from school age and continue into their adult life." The £114m grant will run for three years for Bristol, Birmingham, Leeds, Manchester, Newcastle, Norwich and Oxford. Transport minister Robert Goodwill said the new road building projects would also be "cycle-proofed" in the planning stages. This could include creating advance stop lines or changing signalling so cyclists can go first at traffic lights. Eric Booth, from Bristol Cycling Campaign Group, welcomed the funding but described it as "piecemeal". "The Bristol Cycling Campaign is concerned not just about the core cities - we're interested in areas like North Somerset and South Gloucestershire and the local authorities around us, where people live and work and move into Bristol," he said. "This funding is another example of the piecemeal approach. It's targeted at a small number of cities and this is a real problem for the sustained change that we need." The transport minister said the money had been targeted so the eight cities could lead the way for others to emulate.